Coconut Milk Chocolate with Maple Candied Pecans - Maple cinnamon candied pecans accent an irresistible layer of delicious coconut milk chocolate to give you a crunchy twist to enjoy something different! Coconut Milk Chocolate with Peanut Butter Toffee - Peanut butter fans rejoice! The quintessential chocolate bar has arrived with this bar, where Charm School takes salty-sweet vegan peanut butter toffee bits that pairs perfectly with their coconut milk chocolate to create an indulgence that's almost too good for words, it's that amazing! All Coconut Milk Bars are 2.6 oz. (75g) and $7.99 each. From Hope Nguyen of Corona, California on 4/10/2017 . i got the coconut milk chocolate, and it was SO CREAMY. the coconut flavour was very subtle (i don't really notice it). this is one of the best vegan chocolates i've tried for sure. the only downside is the price, i'm guessing that's why there aren't more reviews? From Leeza of New York, New York on 3/7/2017 . We got the bar with maple candied pecans. It is so good that the first mouthful made me want to sing, And then stuff my mouth with more. What an incredibly wonderful flavor from the combo of the creamy chocolate and the brilliant maple candied pecans! Perfect. Wish we had gotten all three. Why were we so timid? Good on you, Charm School Chocolate! From Diana Pangestu of Stamford, Connecticut on 10/21/2016 . I bought 4 different types of vegan milk chocolate bars from this site and i have to say Charm School bars are the best. So smooth and creamy, absolutely delicious. I'd get the white and the coconut chocolate. You won't be disappointed. From eggplant of vineland, New Jersey on 11/27/2015 . just reviewed the white chocolate bars and thought i'd also put a review here. all 5 varieties that veganessentials carries are perfection! i especially love the plain white bar and the plain milk bar.this is rich creamy chocolate like fine chocolate and not warered down sugary stuff! the peanut butter toffee bar is great too.....eating it as we speak! lets keep these bars popular at v.e. so they never stop selling them! 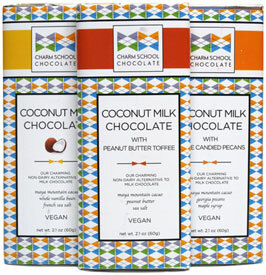 good vegan chocolate is impossible to find,so this brand is wirth every penny!